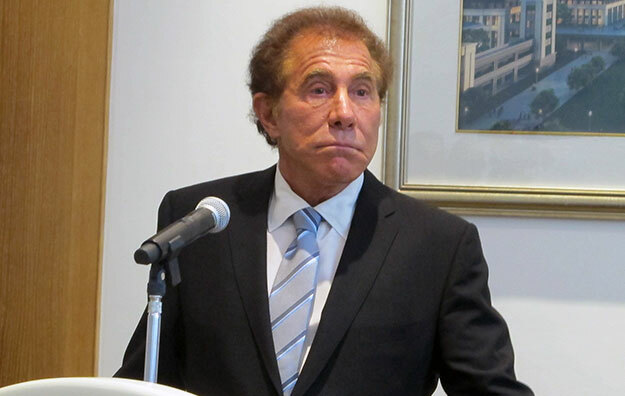 Fallout from the sexual misconduct claims against casino operator Wynn Resorts Ltd’s former chief executive and chairman Steve Wynn (pictured) could include regulators ruling against the “suitability” of the group as stockholder of its regulated casino subsidiaries; and or lead regulators to rule against Mr Wynn’s suitability as a shareholder in the group. So said the 2017 annual report of Wynn Resorts, filed on Wednesday in the United States. Mr Wynn stepped down as the casino group’s chairman and chief executive on February 6. The move followed media reports detailing allegations of sexual misconduct made against him by former Wynn Resorts employees. Mr Wynn has denied the allegations. The “controversy related to Mr Wynn and his separation from the company could significantly harm our business in numerous ways, including in ways that we cannot predict,” stated the annual report. The annual report’s risk assessment also mentioned the possibility of a change of control regarding “certain Wynn Las Vegas LLC debt documents”. It noted Mr Wynn’s ex-wife Elaine Wynn had ongoing litigation seeking to void a stockholders’ agreement to vote her stock with Mr Wynn. This move “if successful, could increase the possibility of a change in control occurring for purposes of certain Wynn Las Vegas LLC debt documents,” noted the annual report. On February 9, Wynn Resorts said it had been informed that Mr Wynn had declared a 2010 stockholders’ agreement “invalid” and agreed to give up control over his ex-wife’s shares of the company, given his resignation a few days earlier. A February 9 filing by Wynn Resorts said Mr Wynn held as of that date 11.8 percent of the firm. According to previous company filings, Ms Wynn’s stake – at about 9.3 million shares – represents approximately a 9.4-percent interest in Wynn Resorts. Voted together, the shares of the ex-couple form a bigger block than any other single shareholder in the company. The 2017 annual report also mentioned the risk associated with ongoing litigation linked to Japanese gaming entrepreneur Kazuo Okada’s 2012 ejection from Wynn Resorts’ board after the casino firm claimed he was “unsuitable” and a risk to its licences. The Wynn Resorts’ board had voted to cancel Mr Okada’s 20 percent stake in the group amounting to 24.5 million shares and issue him with a promissory note for US$1.9 billion. The note was in effect a 30 percent discount on the then US$2.77 billion valuation of his stake. The Wynn Resorts 2017 annual report noted: “The Okada parties have challenged the redemption of [the] shares and we are currently involved in litigation with those parties as well as related stockholder derivative litigation. “The outcome of these various proceedings cannot be predicted. Any adverse judgments or settlements involving payment of a material sum of money could cause a material adverse effect on our financial condition and results of operations and could expose us to additional claims by third parties including current or former investors or regulators,” added the document. Wynn Macau Ltd – the Macau subsidiary of Wynn Resorts – announced on February 6 Mr Wynn had resigned as chairman and CEO of the Macau operation with immediate effect. He also stepped down as director and officer of the unit’s subsidiaries, including Wynn Resorts (Macau) SA, the entity that holds the Wynn group’s Macau gaming concession. The Hong Kong-listed company appointed Matt Maddox – formerly president – as its CEO, with Hong Kong-based entrepreneur Allan Zeman named non-executive chairman. Mr Maddox was also appointed CEO of the parent firm Wynn Resorts. On January 29 the Macau regulator – the Gaming Inspection and Coordination Bureau, a body also known by its Portuguese acronym DICJ – met representatives from Wynn Macau Ltd “better to understand the situation” regarding the allegations against Mr Wynn. The publication of the sexual misconduct claims led the Massachusetts Gaming Commission to open an investigation into Wynn Resorts. The Wynn group is currently developing a casino property in Boston, Massachusetts. The US$2.4-billion project is scheduled to open in 2019. The Nevada regulator announced on January 30 it would launch a formal investigation into the allegations of sexual misconduct made against Mr Wynn.